Summary: this article will illustrate you how to backup files to iPhone 8/Plus or iPhone X iOS 11 from iPhone 7/Plus/6s/SE/6/5s, restore backups from Android to iPhone 8/Plus and import files to iPhone 8 from computer macOS or Windows. As Apple smartphone's 10th Anniversary edition, iPhone 8 is supposed to set the world on fire with big breakthroughs, like Wi-Fi charging, dual-lens camera with AR capability, 3D facial scanning tech, etc. No wonder the famous website forbes reports "Apple Takes A Hit On iPhone 7 Sales, iPhone 8 May Be Worth Waiting For". And Apple has started preparing for crazy iPhone 8 sales, for it places a huge order for OLED screens, up to 70 million from Samsung so far. From these reports, you can predict how popular iPhone 8 will be and how many fans will upgrade to iPhone 8. If you also plan to upgrade your phone to iPhone 8, you are advised to know how to make a backup of your old phone files to iPhone 8/Plus in advance. Thus, when you get your iPhone X or iPhone 8 in hand, you don't have to google how to backup or restore files to iPhone X/8/Plus from your old iPhone, Android or PC. Instead, you can directly backup files to iPhone 8/Plus or iPhone X iOS 11 with much time saved. 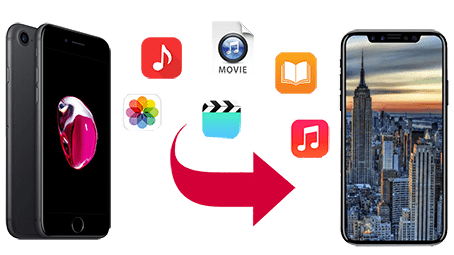 Intel QSV accelerated iPhone transfer tool - MacX MediaTrans to bulk back up and restore files to iPhone 8/iPhone X with whatever file content, including video, music, photos, ringtones, iTunes purchases, DRM-ed M4V files, M3P audio, eBooks, etc. Also mount iPhone 8 as USB flash drive to store anything if needed. To transfer files from old iPhone 4s/5/5s/5C/6/6s/SE/7/Plus to iPhone 8/Plus iOS 11 device, the most common ways are iCloud and iTunes. Of course, you need to make sure your old iPhone has already backed up to iCloud or iTunes. If not, click here to backup iPhone to iCloud or iTunes first. Then we begin to restore file data to iPhone 8 from iCloud backup or iTunes backups. Step 1: Turn on your new iOS 11 iPhone 8 or iPhone X and you will be greeted with a Hello screen. This means your iPhone 8 enters the setup phase. 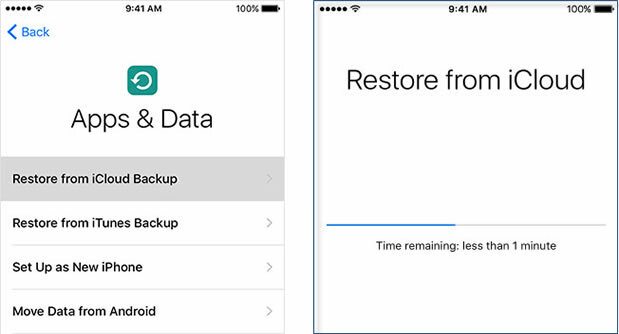 Step 2: Tap Restore from iCloud Backup on Apps & Data screen after a few iPhone 8 setup steps. Step 3: Sign into iCloud with your Apple ID. Afterwards, choose a backup (video, music, photo, message, eBook, etc). After you choose, the file transfer begins. Note: as for your iTunes or App Store purchases, you're required to sign into your Apple ID account again to restore and backup purchases to new iPhone 8. Step 4: Make sure your Wi-Fi connection is in good working condition. Then just wait for the appearance of a progress bar and it completes. You'd better transfer and back up files to iPhone 8 or iPhone X with smaller-sized one and finally restore large-sized file to iPhone 8/Plus. After the restore from iCloud is over, you can eventually enjoy your new iPhone 8 with previous data reserved. Step 1: Launch iTunes 12.6 on your Mac or PC. Followed by the connection between your iOS 11 iPhone and your computer via a USB cable. Step 2: Select your iPhone 8 or iPhone X when it appears in iTunes. If iTunes doesn't recognize your iPhone 8/X/Plus, learn how to fix this issue. Step 3: Opt for Restore Backup in iTunes. And then look at the date and size of each backup and choose the most relevant. Step 4: Hit Restore button and patiently wait for the restore remaining time from mins to one and then zero. BTW: enter the password if you restore encrypted files to iPhone 8 or iPhone X. Step 5: Check and make sure your network connection works fine. You can't disconnect unless the whole iTunes backup restore to iPhone 8 is accomplished. If you are subjected to damage from Samsung Galaxy Note 7 and wanna switch from your Android Samsung device to a new iOS 11 iPhone 8, you can make your plan a reality very soon. Yet, before iPhone 8 release, you need to learn some iPhone 8 tips and tricks on how to transfer files from Android to new iPhone 8. When you receive your iPhone 8, you can immediately start to transfer data to new iPhone 8 with much time and effort saved. Ok, nonsense aside, let's back on track. 1. Download and install Move to iOS app on your Android device. Plus, make sure Wi-Fi on Android is turned on. 2. Plug both your Android and iOS iPhone Editon into charging power. 3. Check if the file content on your Android fits in iPhone 8. If not, convert video, music files to iPhone supported formats with a video converter or compress file size to fit iPhone storage capacity. Step 1: Click Move Data from Android when you reach the Apps & Data screen. Step 2: Open the Move to iOS app on your Android device. Then tap Continue → tick Agree on the terms and conditions → click Next on Find Your Code screen. Step 3: Focus on your iOS 11 iPhone 8. Tap Continue on iPhone 8 and then wait for a ten-digit or six-digit code to appear. Step 4: Enter the code on your Android device and then wait for the transfer data screen to appear. Step 5: Choose the file to transfer and then click Next button on Android. Just leave the two devices alone and wait for both to complete the transfer task. Step 6: Press Done on Android after the loading bar finishes on your iOS 11 iPhone 8/Edition. Afterwards, tap Continue to finish the latter setup steps. For those who shoot tons of beautiful pictures, selfie, funny 4K videos and more, they are disposed to backup them to computer. Because they eat up so much space. When you update to iPhone 8 with 128GB or even larger 256GB storage, you may wanna transfer some files from PC to new iPhone 8 or iPhone X. After all, it's much more convenient for you to have a review on these meaningful photos or upload to Snapchat or Instagram for sharing. To transfer files from computer to new iPhone 8, you can have a try on this versatile MacX MediaTrans, which transforms what used to be a time-consuming chore into something you can take care of in just a few minutes. With Intel QSV hardware acceleration tech, it can bulk transfer videos, music, photos, iTunes purchases, eBooks, ringtones, iTunes U, podcast, etc. from computer to new iOS 11 iPhone 8 or vice versa at full speed. Only 8 seconds cost to transfer 100 4K photos to iPhone 8/iPhone X. Almost 5X faster than iTunes/iCloud transfer speed! Step 1. Free download iPhone transfer tool with Mac or Windows version. And then launch it on your computer. Tip: this iPhone manager will need iTunes to detect your iPhone 8. So you need to download and install iTunes on your PC. But don't worry. The latter file transfer procedure will not use iTunes. So there is no likelihood for you to encounter the iPhone not syncing with iTunes, iTunes half crash issues, etc. Step 2. Connect your iPhone X or iPhone 8 to computer via USB cable and wait for iPhone detection. Step 3. Choose Photo Transfer from the six categories on the main interface. You can also select video, music, ringtone, eBook at your willing. Step 4. Click "Add Photo" to load pictures from PC to iPhone 8. If you hacker for creating a new photo album to manage pictures, just press "+" button at the left side to create a new photo album. Step 5. Hit "Sync" button and then this iPhone transfer tool begins to bulk backup photos to iPhone 8 from computer. Download the best iPhone backup tool - MacX MediaTrans to bulk back up videos, music, photos, iTunes purchases, eBooks, ringtones, iTunes U, podcast, etc. from computer to new iOS 11 iPhone 8.